Knowing what products will attract buyers this holiday season is a must for sellers who want to make money at a time when shoppers are expected to spend less on gifts. Here's one promising market segment to consider: Toys. Their sales may be down 3 percent so far this season, according to comScore, Inc., a research firm that tracks Internet activity. But it's just not the holidays without dolls, teddy bears and board games. And parents can't seem to pass up the opportunity to put a smile on their children's faces and introduce them to toys that made them happy years ago. In fact, fewer than 20 percent of people plan to let hard economic times reduce the amount they'll spend on toys. "When it comes to Christmastime, Uncle Joe may not get a present, but the kids will," says Richard Gottlieb, president of Richard Gottlieb's USA Toy Experts, LLC. "Parents don't want to disappoint their kids. When you disappoint, there's a whole lot of emotions that you go through. Ultimately, none of us wants to say 'No' to our children." Gottlieb calls the toy industry "recession resistant"but he notes that, this year, parents will be looking for toys that have high play value (e.g., board games and game consoles), and passing up "watch me" toys such as Tickle Me Elmo. That already seems to be the case. According to a survey eBay released on Nov. 11, the well known Parker Brothers game Monopoly beat out all the rest to become the all-time favorite game of the more than 3,000 adults polled. Checkers got 33 percent of the votes, according to the survey. Scrabble was women's favorite board game. Games Magazine even entered Monopoly and Scrabble into its hall of fame. And with so many different types of Monopoly games, from the Spider-Man version to one based on the movie "A Christmas Story," people can tailor their choices to suit the children in their lives. Wii and PlayStation tied for the top spot among consoles, something that doesn't surprise Gottlieb. Children and adults both love these games, which allows multiple generations to have fun together, he says. LeapFrog Reading Systems and Speak & Spell were respondents' favorite educational toys, Barbie was voted the best doll and Beanie Babies and Care Bears were the most popular stuffed animals. However, life-like doll Betsy Wetsy was among the least favorite toys with only 2 percent of votes. Still, tough economic times could mean that "Christmas comes late and runs late," Gottlieb says. He thinks buyers may not hit retail stores until two or three weeks before Christmas, which could mean online sales don't pick up until then. So it's important for sellers to let buyers know they will ship items well into January, he notes. "A parent would rather be late than disappoint completely," he says. "Sell throughout the season; don't stop." Giving up early could mean missing out on a lot of money, since Americans spend an estimated $22 billion every year on games for the little ones. Reyne Rice, a toy specialist in the Toy Industry Association, says 50 percent to 60 percent of toy sales come in the last quarter. 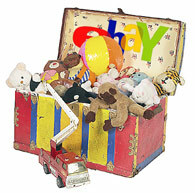 Last December more than 59 million visitors went on eBay to help Santa fill his bag, reports the New York Times. Although Amazon.com got slightly more views during that month, eBay should still be very popular among shoppers. "eBay is the No. 1 place to find the most coveted toys of this year, many of which are reinventions of nostalgic toy favorites," says Cat Schwartz, eBay gadget and toy director. "This holiday season, I'm seeing numerous toys and games on the market that families can enjoy and experience together." And what's important when deciding what to list online? Just ask one question: Is this toy or game fun? If sellers thought it was when they were growing up, chances are so will children today, says Rice. "The toy box and the icebox are the most resilient during a recession," Gottlieb notes. Gottlieb, the father of two grown sons, says he would not skimp on toys this season if his children were youngerand other parents won't either. "It's an expression of love," he says. his attention span has not grown yet. just give him time. and if he likes ciarten cartoons buy things that have that character on it. when you buy a item you should also show him several times how it works and play with him or her. When my son was small his most favorite toy was a plastic car that he could take apart and put back together. the cheapest toy out of all i had bought. Cost me one dollar at walmart. I showed him how he could roll it into the wall and that was all it took. just take him to toy store also and see what catches his attention.